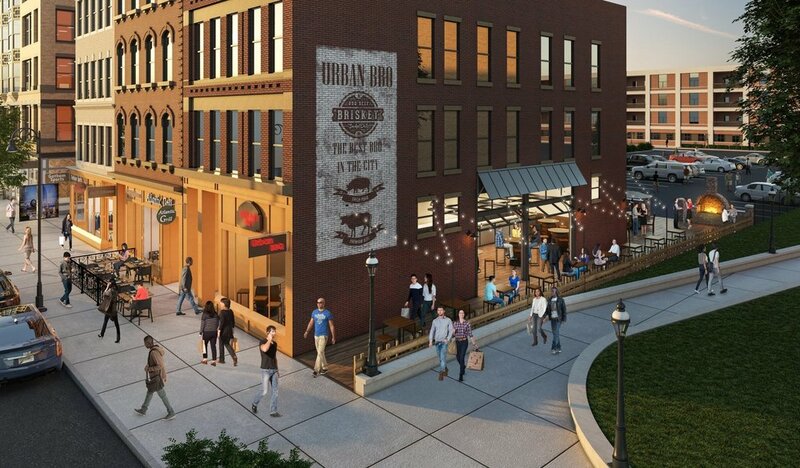 In the world of big mixed-use development, there will always be new master plan proposals that seek to transform moribund urban districts of cities into dynamic and flourishing destinations for visitors, residents, and small and large businesses. From 10,000 feet, it’s easy to spot the new master planned development that dwarfs the scale of the surrounding pattern development of a city that was founded over three centuries earlier. As these districts, necessarily bounded by parcel ownership and neighborhood edges, rub elbows with adjacent properties, the potential exists to learn from their smaller, more people-scaled neighbors and spread the regenerative potential of the district master plan in the process. One of the curious constants about our cities is that while the scale of developments increases, responding to land value escalation and the imperative of good ROI, the importance of an appropriately scaled public realm does not change. When it comes to strolling, shopping and dining in an urban environment, we still exhibit the same tendencies that Jan Gehl observed, with possibly one exception – we consciously crave experiential connectedness. Yes, we tend to gather at the edges, and those edges want to be “active, open and lively”, but today’s user of urban space is also searching for activities that are both authentic in feel and immersive in experience. In a city like Springfield, which was founded in 1636, this isn’t necessarily as difficult as it sounds. Our older cities are characterized by certain “missing teeth” in the urban fabric; sites that once had a building but are now open lots, alleys or maybe reclaimed park space. Utilizing these existing conditions as assets - like in the case of MGM Springfield - might involve exploiting the view corridor offered by a pocket park, opening the building edge to the park, and employing the original masonry party wall as a mural advertising a critical tenant and reinforcing the district brand. The current trend of making storefronts in restaurants and cafes as open as possible has the dual effect of generating activity and interest for the restaurant owner, as well as adding to the overall vibe and dynamic feel of the district street. Sidewalks don’t need to be as wide as you might think to accommodate the activity, and parallel parking is actually a good thing as it buffers people dining at outdoor cafes and window shoppers from the traffic and noise of the street. The variety of scales exhibited by the buildings of our older cities is one of the great characteristics that make the fabric of these historic neighborhoods so attractive. Some buildings are literally one shop wide while others comprise several shops and run the length of the block. In the case of the latter, the quality of architectural details, signage and lighting in combination with the leasing approach can mean the difference between and oppressive sidewalk experience and one of engaging variety and immersive urban experience. Placemaking at the sidewalk scale is first established by uses that allow for a variety of experiences; maybe a barber shop or a post office trip alongside a café outing or the discovery of a boutique to duck into along the way. In the end, creating a dynamic environment along a busy Main Street starts with good programming, but relies on the careful consideration of edges to complete the picture. By utilizing the existing fabric of storefronts, sidewalks and urban spaces, and inserting new features to highlight tenants and reinforce the district feel, a well scaled public realm can foster connectedness and complete the placemaking experience.